[S21] L. G. Pine, The New Extinct Peerage 1884-1971: Containing Extinct, Abeyant, Dormant and Suspended Peerages With Genealogies and Arms (London, U.K.: Heraldry Today, 1972), page 13. Hereinafter cited as The New Extinct Peerage. [S18] Matthew H.C.G., editor, Dictionary of National Biography on CD-ROM (Oxford, U.K.: Oxford University Press, 1995), reference "Ashburnham, William, -1679". Hereinafter cited as Dictionary of National Biography. Friedrich II Großherzog von Baden was born on 9 July 1857. He was the son of Friedrich I Großherzog von Baden and Luise Marie Elisabeth Prinzessin von Preußen.1 He married Hilda von Nassau-Weilburg, Princess of Nassau and Luxemburg, daughter of Adolf Wilhelm von Nassau-Weilburg, Grand-Duc de Luxembourg and Adelheid Marie Prinzessin von Anhalt-Dessau, on 20 September 1885 at Schloss Hohenberg, Bayern, GermanyG. He died in August 1928 at age 71 at Badenweiler, GermanyG. [S38] John Morby, Dynasties of the World: a chronological and genealogical handbook (Oxford, Oxfordshire, U.K.: Oxford University Press, 1989), page 144. Hereinafter cited as Dynasties of the World. 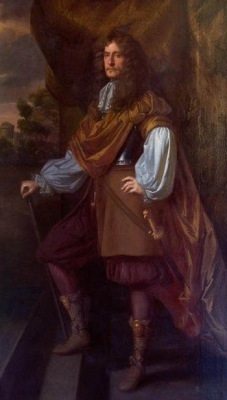 He gained the title of 1st Earl of Marlborough. He was educated at Brasenose College, Oxford University, Oxford, Oxfordshire, England.5 He held the office of Member of Parliament (M.P.) for Westbury in 1597/98.5 He held the office of Lord Chief Justice of the King's Bench [Ireland] in 1604.5 He held the office of Member of Parliament (M.P.) for Westbury in 1604/5.5 He held the office of Member of Parliament (M.P.) for Westbury in 1609/10.5 He held the office of Member of Parliament (M.P.) for Bath in 1614.5 He was created 1st Baronet Ley on 15 July 1619. He was appointed Privy Counsellor (P.C.) in 1624.5 He held the office of Lord High Treasurer between 1624 and 1628.4 He was created 1st Baron Ley, of Ley, co. Devon on 31 December 1624. [S6] G.E. Cokayne; with Vicary Gibbs, H.A. Doubleday, Geoffrey H. White, Duncan Warrand and Lord Howard de Walden, editors, The Complete Peerage of England, Scotland, Ireland, Great Britain and the United Kingdom, Extant, Extinct or Dormant, new ed., 13 volumes in 14 (1910-1959; reprint in 6 volumes, Gloucester, U.K.: Alan Sutton Publishing, 2000), volume VIII, page 493. Hereinafter cited as The Complete Peerage. [S6] Cokayne, and others, The Complete Peerage, volume VIII, page 489. [S15] George Edward Cokayne, editor, The Complete Baronetage, 5 volumes (no date (c. 1900); reprint, Gloucester, U.K.: Alan Sutton Publishing, 1983), volume III, page 258. Hereinafter cited as The Complete Baronetage. Elisabeth Charlotte Alexandra Marie Luise Prinzessin von Hessen-Kassel was born on 13 June 1861 at Copenhagen, DenmarkG. She was the daughter of Friedrich Karl Georg Adolf Landgraf von Hessen-Kassel and Marie Anne Friederike Prinzessin von Preußen. She married Leopold Prinz von Anhalt, son of Leopold Friedrich I Franz Nikolaus Fürst von Anhalt and Antionette Charlotte Marie Jospehine Karoline Frida Prinzessin von Sachsen-Altenburg, on 26 May 1884 at Philippsruhe, GermanyG. She died on 7 January 1955 at age 93. [S12] C. Arnold McNaughton, The Book of Kings: A Royal Genealogy, in 3 volumes (London, U.K.: Garnstone Press, 1973), volume 1, page 125. Hereinafter cited as The Book of Kings. Leopold Prinz von Anhalt was born on 18 July 1855. He was the son of Leopold Friedrich I Franz Nikolaus Fürst von Anhalt and Antionette Charlotte Marie Jospehine Karoline Frida Prinzessin von Sachsen-Altenburg. He married Elisabeth Charlotte Alexandra Marie Luise Prinzessin von Hessen-Kassel, daughter of Friedrich Karl Georg Adolf Landgraf von Hessen-Kassel and Marie Anne Friederike Prinzessin von Preußen, on 26 May 1884 at Philippsruhe, GermanyG. He died on 2 February 1886 at age 30.